Now approved for ASHA CEUs! In this two-day, initial training course, participants will learn to use Therapeutic Listening® modulated audio selections to create individualized, home-based programs for clients. You will also learn how to implement Therapeutic Listening strategies in conjunction with postural, respiratory and sensory activities. This course will take participants from client assessment through treatment with a strong emphasis on practical application using multiple case-studies. Case-study video presentations will be used to illustrate points and show changes in individuals with listening and other sensory processing difficulties. Practitioners who have a background in sensory integration, including therapists in schools, hospitals and private clinics will find this webinar especially meaningful. Occupational therapists, speech/language pathologists, physical therapists, psychologists, physicians, educators, social workers, mental health therapists, and human services professionals. Graduating students or graduate students of the aforementioned fields are also welcome. Participants will receive a Certification in Therapeutic Listening (Introductory). This course provides participants with the necessary background information to immediately begin incorporating Therapeutic Listening into their programs. 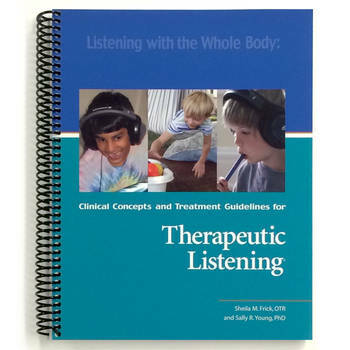 Receive the handbook, Listening with the Whole Body: Clinical Concepts and Treatment Guidelines for Therapeutic Listening, for the special rate of $49 when you add the handbook to your course registration. Discount applied at checkout (S&H fees may apply^). Identify the relationship between listening and sensory integration. Recognize individuals with sensory processing and listening difficulties who may respond well to Therapeutic Listening. Select Therapeutic Listening programs that are adapted to meet specific needs of individual clients. Recognize the role of postural, respiratory, and sensory strategies that are part of the Therapeutic Listening program. You can receive the handbook, Listening with the Whole Body: Clinical Concepts and Treatment Guidelines for Therapeutic Listening, for the special rate of $49 when you add the handbook to your course registration (S&H fees may apply^). There are basic device requirements for Vital Links webinars on LogMeIn’s GoToTraining platform. We have a breakdown of device requirements and internet connections that will assist you. View our Support section for more information. It is each registrant’s responsibility to ensure his/her device is compatible with the noted platform and services.